During the third meeting of the Dean’s Advisory Committee (DAC) for the University Libraries this morning, VT faculty and staff engaged in a productive discussion of research and teaching practices at the university. 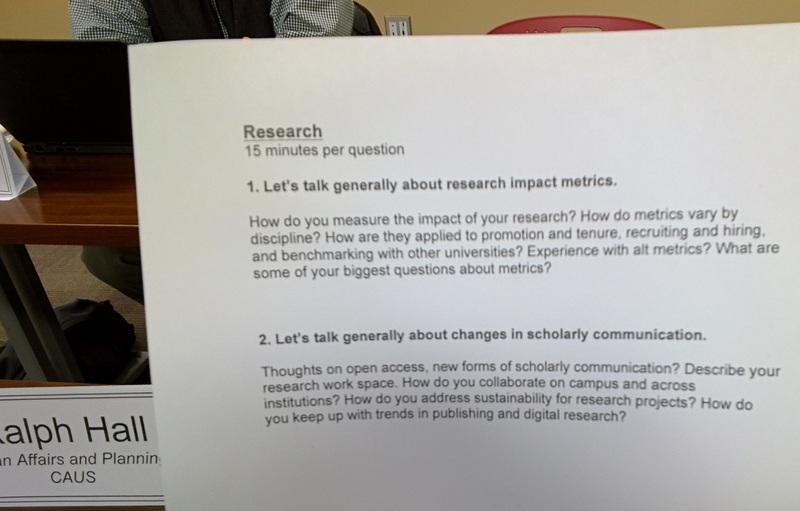 The focus of the conversation was on how university libraries could support emergent trends in areas such as the measurement of research impact, the communication of scholarly material, and teaching/learning environments. 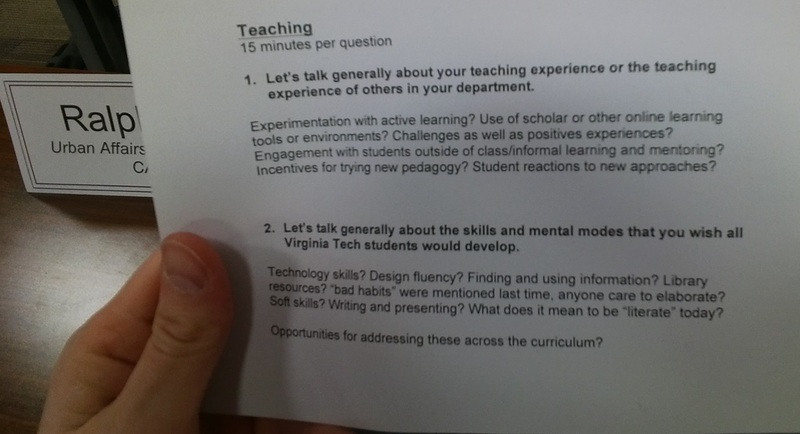 The (slightly blurred) images below (taken through Glass) capture the main questions the working groups were asked to explore during the 1.5 hour session. For me, the value of the DAC meetings is the exposure I have to the broad variety of research and teaching approaches that are used by faculty at VT. A key challenge facing the university (and especially university libraries) is how to support innovative approaches while ensuring the traditional models of research, teaching, and engagement are supported. A lingering question I have is how to advance VT’s “hands on, minds on” vision via the platforms I use to support my classes. My use of Google Glass and Apps has enabled the fluid sharing of information among class participants (and with the public in some cases). It is also allowing me to provide personalized (and private) video feedback on assignments to students via YouTube. The deeper question is whether or how this platform can help me advance the “hands on, minds on” vision. In some courses it can be difficult to find ways to provide hands on experience – e.g., think about international development courses where it is not feasible to take students overseas – but technology can be leveraged to close the distance gap. This evening I plan to take part in a Twitter conversation with VT students and the author of the Crisis Caravan (see below). Such opportunities provide new ways for students to engage with professionals and the general public. While not “hands on” in the traditional sense, there are certainly aspects of this engagement process that require students to demonstrate their social media skills (=hands on) and mastery of the subject matter (=minds on). 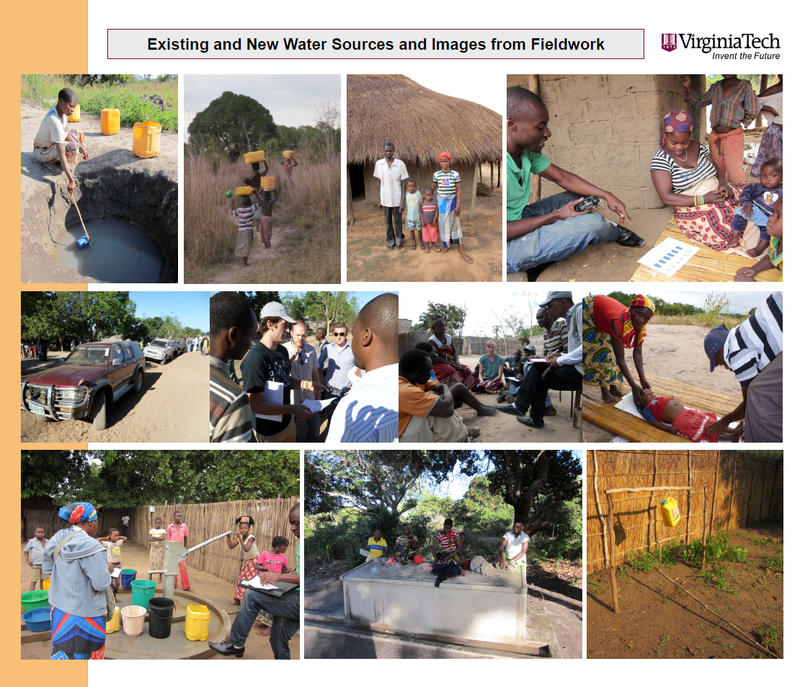 This morning, Emily Van Houweling and I presented the results from the impact evaluation our team undertook of an MCC-funded rural water supply project in Nampula, Mozambique, at the “Experience Virginia Tech: Learn, Explore, Engage” event. During the event, I recorded (using Glass) a number of the presenters talking about their research and work at the university. The video below captures these comments and provides some insight into the breadth and depth of research that is underway at Virginia Tech. This weekend I will be taking part in the “Experience Virginia Tech: Learn, Explore, Engage” event that was commission by President Sand’s to showcase the university’s impact on the world around us. 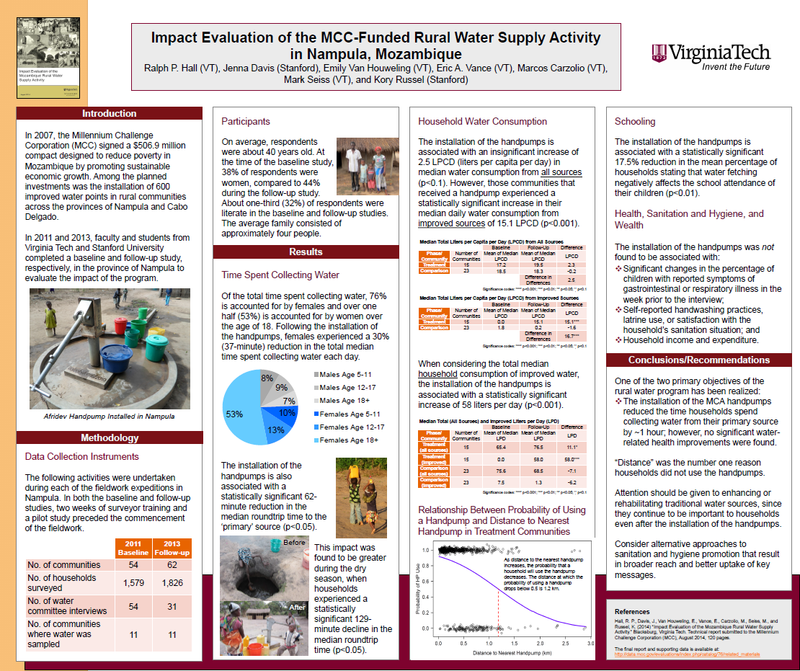 From 9am to noon tomorrow at the VT Inn, I will be presenting the three posters below that document the research and main findings from an impact evaluation I led of an MCC-funded rural water supply project in Nampula, Mozambique. I plan to capture key moments from the event using Google Glass and will post some images and video to this blog and to my Google+ account during the day. I had the pleasure of spending today with Prof. Sudhir Misra (Co-PI of the IITK-VT Partnership), during which we held a number of meetings with senior faculty at Virginia Tech focused on the future activities of the IITK-VT Partnership. Prof. Misra also provided a guest lecture in the graduate course on Advanced Urban Infrastructure Planning (UAP5854) – the first course at VT to be associated with the IITK-VT partnership. 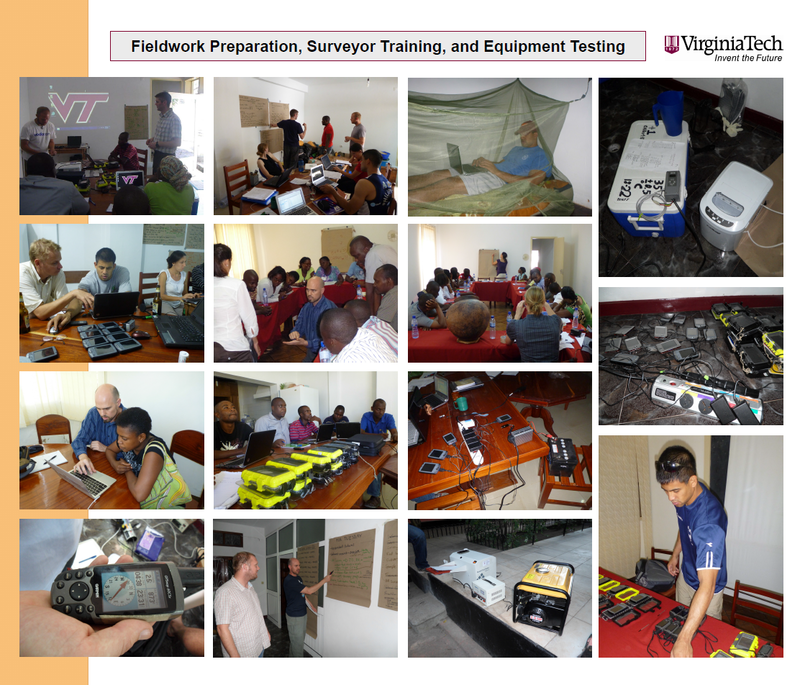 In between these events, we were able to find ten minutes during which I asked Prof. Misra several questions about what the IITK-VT partnership has accomplished and where we plan to take the partnership in the future. The video below captures our conversation that I recorded using Google Glass and edited in Camtasia. Below are a few pictures taken through Glass this afternoon at the College of Architecture and Urban Studies (CAUS) Champagne and Strawberry Reception at the Smithfield Plantation. On Sunday, May 4, a conversation between Robert Ashford, Joyce Rothschild, Woody Crenshaw, and I aired on Talk at the Table with Andy Morikawa. During our conversation, we explain the basic idea of binary economics and how it relates to critical issues such as growing income inequality and sustainable development.